It's the day after Christmas. Whew. The holiday rush has gotten to me real bad, I almost thought I'd end up as replacement to The Christmas Grouch. A long list of must-buys, almost-daily parties, and the slow crawl of traffic everywhere can make one's energy just fly right out of the window. Fortunately, the tiring holiday season is almost over. Just a few more get-togethers to go to, and I can welcome long hours of sleep again. Yey! So, out of habit, I hop on my trusty weighing scale. I haven't gotten to check on my weight in quite a while. The scale tipped at X pounds. Gasp! That's 12 pounds more than how I weighed prior to Christmas season. As with any other life crisis, what followed was the feeling of DENIAL. 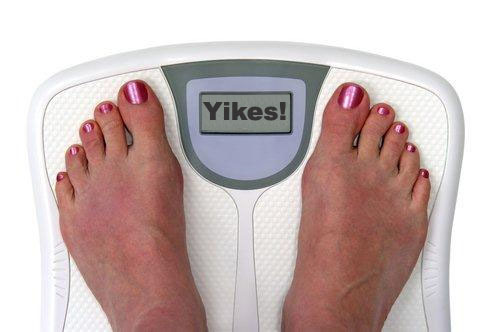 I took the old weighing scale, stirred it, and shook it a few times. Finally, I tried to tweak the small knob here and there. The repetitious weight checking from way back must have taken its toll on the poor scale. I'm pretty sure it had gotten defective. Plus 12 pounds?? Nah. I rummaged through my closet to get my digital weighing scale instead. Battery's still intact. Great! I hop on it, hoping to get the truth. "Huh? Plus 12 pounds?" The second emotional stage came in: ANGER. What the heck is going on? Why am I surrounded by such defective scales? I am returning this fairly new digital scale and getting myself a refund! The next minute, I was BARGAINING. "Lord, how could this happen to me? Please make me 12 pounds lighter and back to my previous weight. I promise not to down another Conti's brownie again. I won't even touch leche flan, fruit salad, and pasta this New Year. I won't even stare at food, I promise!" But with all things that come in life, there is a need for ACCEPTANCE. I finally understood the whole weight-watching drama. As I look back at how the 12 pounds had been added to my already-well-insulated physique, I began to thank God. I gained the extra weight, because I enjoyed feasting with friends and family this holiday season. I never held myself at every Christmas gathering. I ate, drank, and celebrated as my friends did. I temporarily held off my diet to be able to party without reservations. That's where the 12 pounds came from: quality time, bonding, fun. I put back the digital scale inside the closet. I took the other one from the trash bin and placed where it used to be. There was nothing wrong with both. They told me the truth: I gained 12 pounds, but I had fun too. Weight management is important, but for me, time spent with friends and family celebrating with good food this Christmas season is far more valuable. I can always go back to my diet and to the gym after the holidays anyway. Corny kaya mag-diet pag Pasko! So, for now, I'm ditching the scales, and I'm off to my next post-Christmas party! Wohoo! haha! yes, tita! ready to them pounds! wapak! My Christmas Wish List: Updated!